O ttawa The members listened intently and applauded frequently as they were addressed by friends from the Canadian labor movement. Unfortunately what they were hearing was less a Canadian problem than part of an orchestrated international attack by governments and corporations on basic employment standards and unions. Sean McKenny, President of the Ottawa District Labour Council, and Chris Robert, Senior Researcher for the Canadian Labour Congress, were both vivid in describing the real issues behind the settlement of the Air Canada strike with the Canadian Auto Workers over the weekend. For the government to move within 16 hours of the strike was little more than a signal that the new Harper majority administration was fired up for a power play with a slap shot at labor. Clearly the economy was not endangered. Furthermore, a lot of the issue was about pensions, particularly defined benefit pensions which are essentially deferred compensation, and the company’s effort to run from that responsibility and put retirements at risk without paying for the risks. The same thing is happening throughout North America and many other parts of the globe. L ynn Beu, a vice-president with the Canadian Union of Postal Workers (CUPW) showed up and let people know that essentially the lockout imposed by the Postal Service was the same kind of thing. The excuse for the lockout was a 23 person called strike! 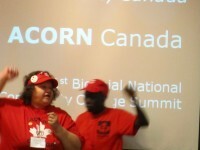 Lynn had the crowd going as well when she talked about the partnership already being forged between CUPW, ACORN Canada, and ACORN International in the Remittance Justice Campaign and the fact that they had circulated the original ACORN International report to unions all over the world. Why shouldn’t the postal service be offering a cheaper alternative, she asked? Absolutely, the members agreed! 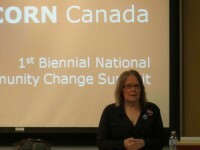 In talking about her enthusiasm for the New West and Ottawa living wage campaigns, she mentioned that when she had first heard about it, she had thought, “Living wages…what could be better than that?” It sounded like a new slogan for the campaign to me. Hard times but good friends. This entry was posted in ACORN International, canada and tagged canada, Canadian Auto Workers, Canadian Labour Congress, Canadian Union of Postal Workers, Chris Robert, Labor Movement, Living Wage, Ontario Labour Federation, Ottawa, Sean McKenny by wade. Bookmark the permalink.